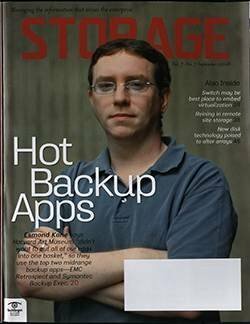 Are full backups a thing of the past? In the not-so-distant past, we relied on tape backups for operational recovery, disaster recovery and long-term data retention. But are full nightly backups to tape still needed now that we have new disk-based technologies like snapshots and continuous data protection? Our View: Whom do you trust? Is there a standard ratio between RTOs and RPOs, or are they independent of each other? Continuous data protection (CDP) technology is now a viable alternative to traditional backup software and storage system-based replication software. But CDP products can vary significantly, especially in the context of different storage architectures. Depending on specific environments, companies may have to evaluate very different criteria before settling on a CDP product. Exaggerated claims, rapidly changing technology and persistent myths make navigating the deduplication landscape treacherous. We list the top five dedupe myths and provide tips to help you get a deduplication product that fits your organization's needs at a competitive price. Hard disk drives have been around for more than 50 years, but the technology is on the cusp of big changes--SAS, a shift to the 2.5-inch form factor and a steady increase in disk drive capacity--that will affect enterprise storage for years to come. What should you consider when choosing between Network File Sharing (NFS) or Common Internet File System (CIFS)? There are a number of ways you can virtualize your storage, but because a switch-based virtualization engine works out-of-band, there's no need for server agents, making it the most scalable and highest performing of all virtualization architectures. Why are you using a VTL or why have you decided not to use one? Virtualized servers yield many benefits, but they can also add complexity to backup operations. There are three main ways to back up a virtual server. Here's how to determine which method is best for your virtualized server environment and storage requirements. What storage product would you like to see on the market that isn't now? CommVault's Galaxy solidified its position as the top enterprise backup product by finishing first for the third time in the four years we've conducted the Quality Awards. Among the midrange products, EMC Retrospect retained its crown as group champion. From disaster recovery to capacity optimization and dedupe, the next phase of VTL products promises change. Results from Storage magazine's most recent Purchasing Intentions survey reveal that respondents will have to expand or alter their backup systems to protect ever-growing data stores. Backup performance tuning is an art, but identifying infrastructure bottlenecks is more of a strict mathematical exercise once you know the important numbers. And understanding the source of existing and potential bottlenecks makes it easier to find and resolve them. If you have a data migration project in the works, challenge your storage vendor, storage software vendor or third-party consulting firm to deliver a solution that reduces the time, risk and cost of your project. The time has come to shed your traditional, compartmentalized view of backup and embrace a recovery-centric data management focus. Are you one of those companies that leaves inactive data on the most expensive architecture and applies stringent (expensive) processes to that same data? If so, wise up!